With this command from the navigator, my watchmates and I throw our weight against the steering paddle to bring our vessel off the wind. For days, we've been sailing through heavy swells frosted with whitecaps. A chilled 25-knot wind blows over our bow. Rain slants across the decks. We are aboard a sailing craft the likes of which have not been seen for centuries. She is called Hokule'a - star of gladness - and she is a replica of canoes that once carried Polynesian explorers to discover and settle thousands of islands in a vast watery domain known as the Polynesian Triangle. Since she was launched in 1975, Hokule'a has sailed to all the corners of the triangle - except to the east which is anchored by the tiny island of Rapa Nui (Europeans call it Easter Island) - our destination. To a modern sailor's eye, Hokule'a appears strange. She is sixty-two feet long. Her twin hulls are joined by laminated wooden iako and fastened by rope lashings woven into complex patterns reminiscent of the art of M. C. Escher. The deck is lashed over the iakos to provide a place for the crew to live during the day. 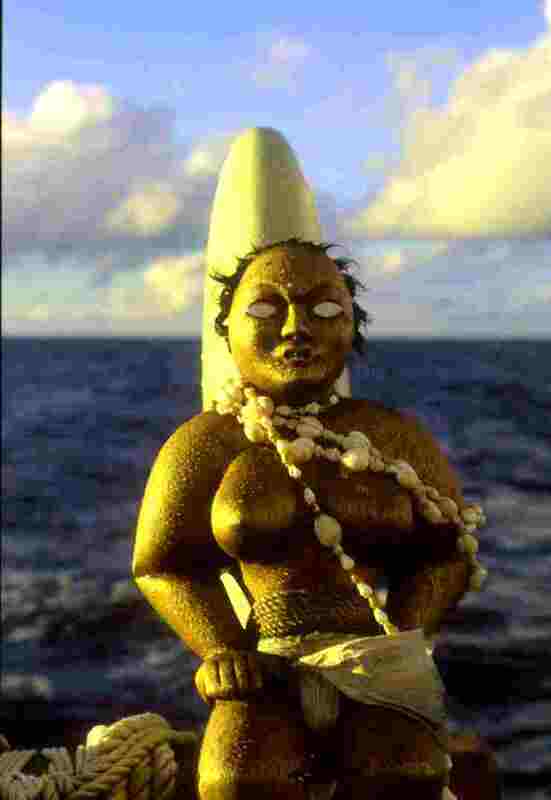 The hulls rise up sharply at each end and terminate in a graceful arc, called a manu, where wooden figures with high foreheads and protruding eyes, the akua or guardian spirits, stare out over an empty sea. Viewed from above, the canoe's strangeness is dispelled. She looks like a catamaran. Hokule'a's shape is ancient but her construction is not. A hundred years ago, her sails would have been woven from Pandanus frond, but no one knows how to do that today so they are made of Dacron. Her hulls are fiberglassed marine plywood because the art of carving such canoes from live wood has almost vanished along with the ancient canoe makers, the kahuna kalai wa'a. Nainoa Thompson, the canoe's navigator, calls her a "performance replica." "We wanted to test the theory that such canoes could have carried Polynesian navigators on long voyages of exploration throughout the Polynesian triangle. We wanted to see how she sailed into the wind, off the wind, how much cargo she could carry, how she stood up to storms. Could we navigate her without instruments? Could we endure the rigors of long voyages ourselves? Frankly, that was enough of a challenge. It didn't matter if the canoe was made of modern materials as long as she performed like an ancient vessel." The Polynesian triangle is a huge chunk of real estate, larger than all of Europe. Before her first voyage in 1975, academics and seafarers were pretty much mystified by how the Polynesians settled such a vast ocean. Thor Heyerdahl had a vision of sailors riding the prevailing winds and currents from South America aboard balsa rafts - drifters, not sophisticated seafarers. In 1948, he sailed Kon Tiki from Peru to the Tuamotu Islands to settle the point. But he was wrong. Evidence from archeological excavations, genetic research, linguistics and anthropology has since proven that Polynesia was colonized from Southeast Asia by sailors who voyaged against the wind and currents, explorers embarked in craft much like Hokule'a. It is September 29, the 8th day of our voyage. For the last week we have lived in our heavy weather gear--working, eating and sleeping fully tented in glossy yellow Patagonia slickers. "This voyage will test you," Nainoa told us a few days before departing, "it will test you physically, mentally and spiritually." After our watch, we seek shelter in our "pukas" - a space about 6 feet long and 3 feet wide under a sloping canvas roof which is only partially watertight - it bleeds brackish droplets, a mixture of salt spray and rainwater. Still carapaced in our foul weather gear, we slither into our berths and try to sleep, grateful for the respite from the cold wind and the cry of "bring her down!" But one of us almost never goes below. Nainoa spends his time on deck in all weather, mostly awake, always alert to the wind, stars and swells. He catnaps in bad weather like this, a sprawled lump of yellow pants and slicker, his hood pulled tight over his head, for maybe 15 minutes at a time. The rest of us sleep at least 6 hours a day and often more, yet we still are fatigued. From our jumping off point in Mangareva we plan to sail east more than 1500 miles into the open Pacific. We will navigate as the ancients did - without charts or instruments, we will use the stars, ocean swells and flight of birds to guide the canoe. Our target is tiny, Rapa Nui is only about 14 miles wide and 20 long. An error of only ½ a degree in estimating latitude (an equivalent of 30 nautical miles) will cause us to sail past the island. The next stop will be South America, 2000 miles away. "The voyage to Rapa Nui will be the ultimate proof that our ancestors were able to navigate successfully anywhere in their world," Nainoa told us before we departed. During the voyage Nainoa spends most of his time on the navigator's platform aft, staring out to sea. I am careful not to interrupt his concentration, waiting until his vision has refocused on something aboard the canoe before talking to him (my job is to document the voyage in words and photographs). I begin to see Nainoa willing himself back a few thousand years to an era when Polynesian navigators sailed across this same expanse of ocean. "When everything is going right," Nainoa once explained to me. "I get into a zone, a special place in which all of my relations with the canoe, the natural world and the crew are integrated. You have to be in that special place to navigate well. When you are in the zone, you feel ahead of the game. You find yourself naturally thinking about what will happen next and you are acting in the future, not reacting to things in the past. You have the star patterns in mind and you seem to know where you are even when the sky is cloudy and you can't see the stars. You begin to anticipate the weather. It's an awesome feeling but it's hard to describe. It is like being inside the navigation, participating from the inside." Nainoa's system of navigation is like all great discoveries - both complex enough to render description difficult yet, at its foundation, incredibly simple. It is based on years of observation, both of the real sky and of an artificial one - in the planetarium of Hawaii's Bishop Museum. It is also based on the teachings of Mau Piailug, one of the last Micronesian Palu, navigators who find their way by a world of natural signs. As a compass Nainoa uses the rising and setting points of stars. On this voyage, for example, Sirius rises at 107 degrees and Aldebaran rises at 70 degrees; while Vega sets at 317 degrees and Antares at 242 degrees. In the entire menu of Nainoa's directional stars there are about 200. Swells also provide clues to steer by. Take the southwest swell (Correct?) that has accompanied us for the entire voyage. Generated by a hurricane off the coast of Australia, more than 5000 miles away, it is satisfyingly deep and constant. We set our course by it at during the day and at night when the sky is occluded, which is often. The big trick, of course, is not just knowing where we're going but where we are at any given moment. Determining Latitude, our position north and south, is accomplished by judging the altitude of stars above the horizon when they are at the meridian - the highest point in their arc across the sky. Each star tells a different story because it arcs differently, so the navigator has to memorize the path of dozens of them. Judging altitude takes practice and the ability to use one's hand as a crude instrument. Nainoa's little finger, when held at arms length and adjusted to lie along the horizon, marks off 2 degrees of altitude. Sighting along the crease between his hand and upthrust thumb gives a reading of 13 degrees. During Nainoa's study in the planetarium, he traveled across the ocean in compressed time to observe patterns in the wheeling night sky. He noticed certain pairs of stars rising and setting on the horizon simultaneously - but only at one specific latitude - a phenomenon he calls "synchronous rising and synchronous setting." When Murzim (near Sirius) and Alhena (in Gemini), for example, drop below the western horizon at the same time he knows the canoe is at six degrees south latitude. When Sirius and Pollux set together he knows that his position is 17 degrees south. Every day at sunrise and sunset, Nainoa gathers with two assistant navigators, Chad Baybayan and Bruce Bruce Blankenfeld, to assess their progress in the previous twelve hours. On the morning of October 1st at dawn, the three men look out over an ocean stirred only by gentle undulating swells and ruffled by tiny wind ripples. "What an awesome night that was," says Nainoa, "I saw Jupiter rise on the horizon, so the atmosphere was really clear. I was able to get a good view of Atria in the south and Ruchbah in the north. The latitude I got from Atria was 25 degrees S, and from Ruchbah I got 26 degrees S. I think we ought to average the observations so let's say we are at 25 degrees 30 minutes S."
Longitude cannot be found without a chronometer, so the navigators rely on a system called, appropriately enough, "dead reckoning." They estimate the time and speed they steer a given course and, on a mental map, they place themselves along an imaginary course line toward their destination. Last night, on the 6 to 10 p.m. watch, Hokule'a was beset with light fickle winds. "I don't think we made any progress during that watch," Nainoa says. The canoe was stalled during the other watches as well. When the three men add up their estimates of miles traveled during the night - factoring in the effects of steering various courses as the fickle winds permitted and leeway - they arrive at an estimate of only 6 miles of easting. But this progress was impeded by a westerly current so the net distance traveled east was only 3 miles. According to their calculations, the distance to Rapa Nui is now 461 miles. In all of these calculations, errors naturally accumulate. "We can guess our distance traveled by dead reckoning, if we are very careful, with maybe a 10% error, and we can guess our latitude with an error of about one degree," Nainoa says. I do the math in my head - 10% of 1500 miles (the distance along our east- west course line toward Rapa Nui) is 150 miles. One degree of latitude (along a north south line) is 60 miles. So that gives us a box of accumulated error that is equivalent to nine thousand square miles. Finding the tiny island in that vast space seems at best improbable - but that's a personal opinion, which I keep to myself. "One thing has always been certain," Nainoa says, "if we looked at this voyage scientifically there is almost no chance of finding Rapa Nui. If we thought that way, we would not have chosen to go. But you know what? I bet we find it!" During the evening of October 2nd, the sky presents millions of stars. The wind is gentle, northerly. Jupiter rises ahead, almost due east. I steer by aligning skymarks with various parts of the canoe - Jupiter with the forestay, the Scorpion with the upthrust sternpost, Alpha Centauri with a starboard shroud. As Jupiter rises from the sea it arcs north. The angle its arc makes to the horizon matches both our latitude and the tilt of Earth's axis, about 26 degrees. When Jupiter rises as high as Hokule'a's mast it no longer serves as a trusty guide, but then Saturn breaks the horizon and I line it up with one of the canoe's fore shrouds. The ancient Hawaiians called the planets hoku 'ae'a - wandering stars - because they appear to move through the otherwise permanent starfield. Our ancestors probably employed the planets as we do, by using the stars to determine their positions before we set our course by them. During the next four days the winds are fickle, on and off from differing directions. The sky clouds over. During the evening of October 6th and the early morning of the 7th we continue toward Rapa Nui, tacking occasionally to take advantage of wind shifts, hoping the sky may provide a glimpse of our guiding stars. This does not happen. With only the swells to provide direction, our navigators guide us to our rendezvous with an invisible abstraction - the latitude of Rapa Nui - 27 degrees 9 minutes S.
At 6 a.m. on October 7th, Bruce, Chad and Nainoa predict that we are 28 miles north of the latitude of Rapa Nui and 217 miles west of the island. But we have sailed a zigzag course for the last few days, which makes dead reckoning difficult. Under the best of conditions, error accumulates - and, for the last few days the conditions have been far from the best. All that night and on into the morning the winds continue to blow strong from the northeast and Hokule'a responds by speeding east-southeast - 6 to 7 knots at times - slicing through the waves, producing long tendrils of spray from her bow. Lookouts are posted. Near dawn, Max Yarawamai spots two holes in the clouds ahead low on the horizon. "I looked carefully at the two holes," Max explained later, "checking first the one on the starboard side. I saw nothing there so I switched to the hole on the port. I saw a hard flat surface there and I watched it carefully. Was it an island? The shape didn't change! It was an island all right." Nainoa's latitude estimation was dead on, and his dead reckoning of longitude was accurate to within perhaps fifty miles. We had found the dot in the ocean. During that day we sail toward the island. Night descends. The lights of Hanga Roa glisten on the eastern horizon. We ghost along the coast of Rapa Nui until the watch change at ten PM when we tack toward the island - a dark smudge on the horizon against a glittering curtain of stars. The 6-10 watch lingers on deck, enjoying the last few moments of comradeship with each other and with our canoe. We watch Jupiter and Saturn rise over the island to starboard and to port the Pleades and their guardian, Taurus. We do not speak - our presence together on Hokule'a's heaving deck expresses more deeply then words the bond that has been made in the last seventeen days at sea. Reflecting back on the trip, I remember a serene and crystalline night when Hokule'a slipped gracefully over gentle swells. The canoe's deck, open to the skies, made it seem like I could reach up and touch the Milky Way. Plankton glowed in our wake, turning the sea as effervescent as champagne. Large globs of green light flared up, shimmered for an instant, then slowly faded. We seemed to float through a universe of jewels. I watched the helmsman bend over the canoe's massive steering paddle. In silhouette against the sky he appeared engrossed in the performance of an ancient ritual. Here, perhaps as far away from the influence of modern life as one can get, time stood still. 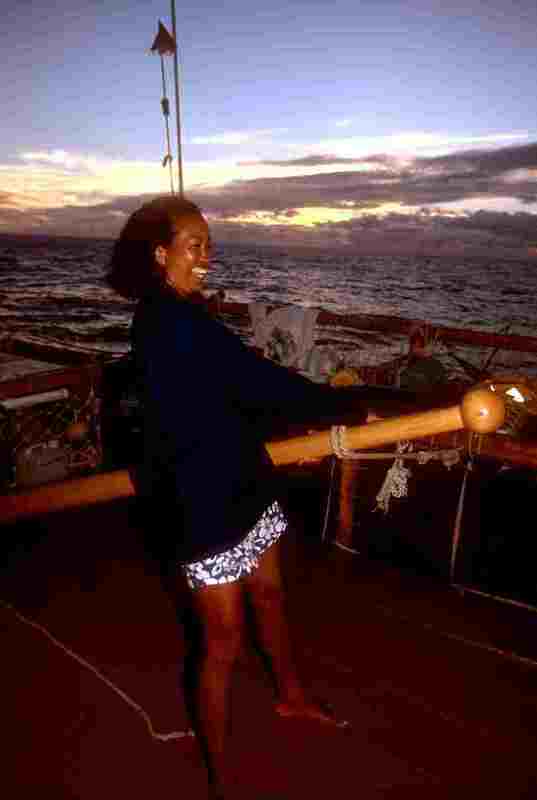 I imagined myself on the deck of an ancient Polynesian canoe, making the first voyage to Rapa Nui. The past lived.